When reviewing this past years Division III offensive statistics, you don’t have to look far to find Shenandoah. That’s because they are No. 1 in passing offense with 3,865 yards passing on the year. That’s good for 386.5 yards per game passing. They also average a whopping 40.8 points per game this year. Good for 19th in Division III. Stan Hodgin was kind enough to break down one of his favorite concepts for us on the Coach and Coordinator Podcast. He calls it “H-Cross.” Hodgin is an “Air Raid” disciple, so this play may resonate with some of you out there. It’s eerily similar to the Air Raid’s Y-Cross concept that was popularized by Hal Mumme, Mike Leach, Lavell Edwards, etc. Coach Hodgin was frustrated with some of the success he was having on the typical “Y/H-Cross” concept, so he decided to tweak it. 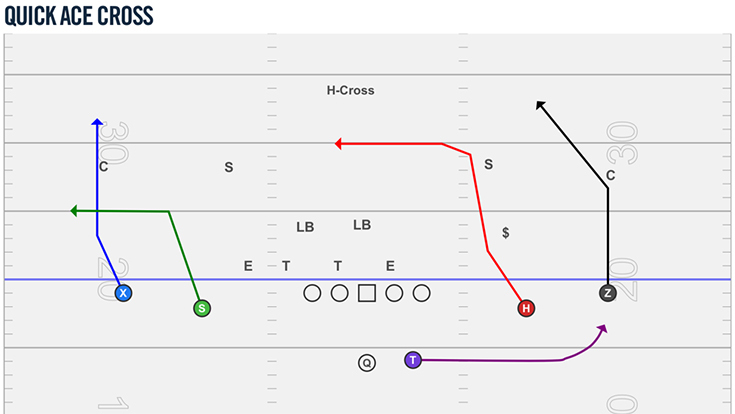 So often with the Air Raid’s original version of the Y-Cross concept, the quarterback always had the ability to change routes of wide receivers. 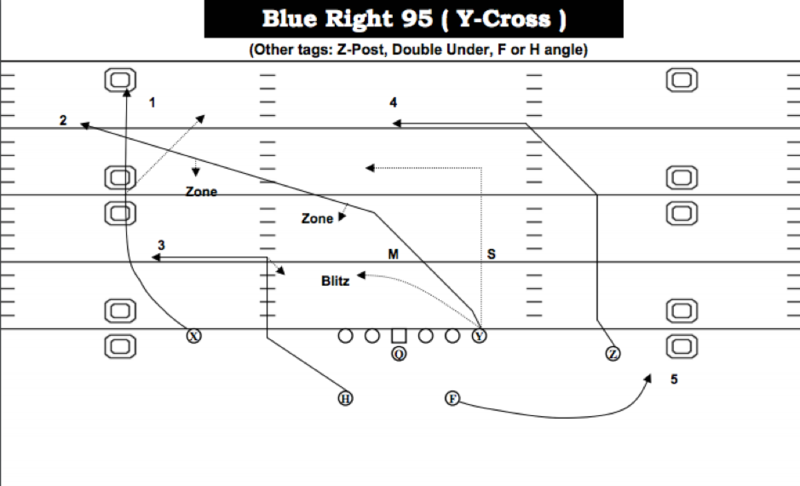 Specifically, in the Y-Cross scheme, the quarterback could alert the Z receiver to run a post route. In Hodgin’s new version of H-Cross, he has the Z receiver on a locked post. The quarterback is not to change that route because it is a key part of the progression now. Coach Hodgin was having a lot of success with their vertical passing game but felt as if they were leaving a lot of yards on the field with the “cross.” In the past he said they were reading an underneath defender on cross, and really just hitting the cross or the swing route. This was leaving a lot of yards to be gained on the post route. 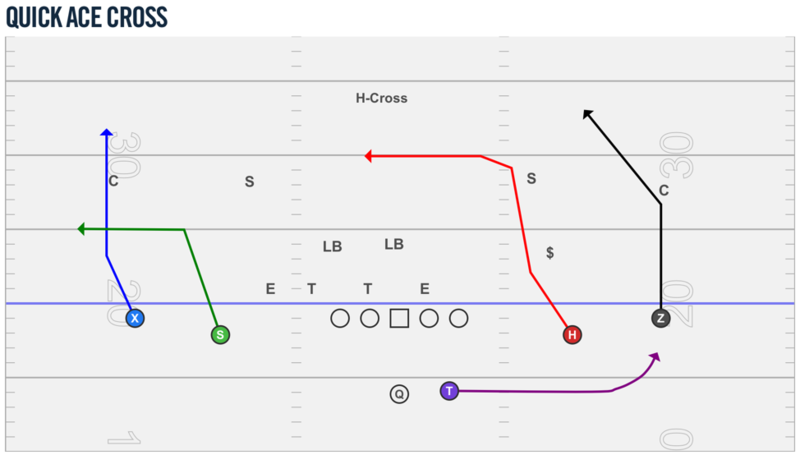 In spring ball a few years back, he started toying with reading the safety to the side of the cross and found that they were having a lot more success with the concept that way, specifically with hitting the post route. Here’s how the progression works on Hodgin’s H-Cross. Against any sort of pressure/blitz, the pressure-out from No. 2 is the quarterback’s blitz beater. If he does not get blitz, the quarterback is looking to read the safety to the side of where the cross route is coming from. The offense is trying to hi-lo the quarters safety, or the middle of the field safety in a Cover 1 or Cover 3 coverage. In Quarters defense, if the safety comes down to drive on the cross, the quarterback will hit the post route from the Z receiver. If the quarter safety, or middle of the field safety, stays high on the post route, then the quarterback will work from the cross to the swing route from the running back. The clip below shows an example of Shenandoah running their H-Cross concept. Notice how the quarterback is reading the quarter safety to the side of the cross route. Once the safety drives on the cross route, the quarterback hits the post route from the Z receiver. The clip below is an example from a trips alignment. When the offense aligns in trips, the No. 3 wide receiver is now running a shallow cross at the heels of the defensive line. The shallow cross is now the blitz beater for the quarterback. The quarterback is still reading the safety to the side of the cross route. Once he drives on the cross route, the quarterback hits the post route again. This clip is an example of H-Cross when the safety towards the side of the cross floats towards the post. When the quarterback reads that safety dropping to the post, he is now reading cross to swing. It’s not hard to see why Stan Hodgin is having so much success offensively at Shenandoah. His ability to simplify his concepts for his quarterbacks and define reads make for a big play offense that puts up a lot of yards.